Each shawl is unique and patterns and colors may vary. Some shawl colors are iridescent, bright, or muted. Please choose a color range and give the gift of love and blessing. Your Blessing Shawl is embroidered with the word “Ayubowan” a blessing which says, “May You Be Blessed With A Long Life” in their Sinhalese writing. Click here to learn more. This is a superb gift filled with their love, gratitude and blessing that your friends and loved ones will cherish. The Blessing Shawls can be used fully open, folded in half length wise, as a beach wrap, or as a table dressing. 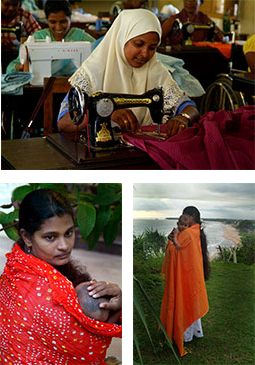 Each shawl is accompanied by a beautiful four color postcard with the photos of the women and remember your donation is also tax deductible! Buy the world finest Morawaka low country Orange Pekoe Broken Leaf Tea from Sri Lanka, 100 handmade tea bags by the women of the tea estates.